The high school students at Omaha North installed their HOGs themselves, learning the practicalities of rainwater catchment and reuse, and irrigating their school garden. Installation Stats Omaha North magnet high school built a LEED silver four-story addition and a two-story greenhouse. Two HOG tanks are in the wedge between the new and old building collecting rainwater for landscape irrigation, and one waters plants in the greenhouse. “I can water the entire place in 5 minutes when I turn the HOG on,” says Lee Kallstrom from the Engineering Technologies department. Science, engineering and technology are the focus at Omaha North magnet high school in suburban Omaha, Nebraska. With students doing the hands-on installation themselves, they learn practical construction techniques alongside the sustainability principles taught in the technical curriculum and illustrated by the building and greenhouse. Where is it now? The school, which earned a silver certification for its sustainable addition, is the first in Nebraska to be certified under the LEED for Schools system rating. By building green, Omaha North H.S. reduced its energy use by 20% and its potable water consumption (with low-flow sinks, dual-flush toilets, and rainwater tanks) by 43%. In the winter of 2012, “the wedge” platform gave way in -20ºF temperatures. Students rebuilt in the spring (at a height of 24 inches to allow the water to drain completely from the tanks) and took the extra security measure of strapping the two HOG tanks to the building. This August, the University of Wollongong in Australia took home first place in the China Solar Decathlon 2013 with their Illawara Flame House. The Illawara Flame House designed by UOW Australia. Image via Inhabitat. Co-hosted by the US Department of Energy, and the National Energy Administration China, this was the inaugural Solar Decathlon on Asian soil. Much as American and European competitions do, the China 2013 competition challenges university teams to design, build and operate solar-powered houses that are cost-effective, energy-efficient and attractive. Why is it beautiful? Richard King, from the US Department of Energy, calls the victory of the first ever retrofitted home to enter the competition “remarkable.” He commended the Illawara Flame as a “modern, very energy efficient house that won the praise of everyone who [went] into it.” The Australian team was inspired by their native Illawara Flame Tree’s spring time renewal and transformation – a metaphor for their radical approach to refurbishing an existing home rather than creating a brand new building. Why is it useful? “It all began with the idea of retrofit,” Team UOW explain in their walk-through video of the Illawara Flame home, which has been designed for an older couple whose children have left home. The home design emphasizes water efficiency, solar energy harvesting, passive design and advanced ventilation systems. Three bedrooms have been converted into two, with a large open space for the dining room and living room. Multiple windows promote flow between indoor and outdoor space. Why is it green? With 8 million homes in Australia that account for 13% of carbon dioxide emissions, refurbishing existing ‘fibro’ homes to a net zero energy standard upcycles homes for the next generation. It also eliminates the waste of tearing down existing buildings. “The Illawarra Flame is perfect for clients looking to downsize while ensuring a clean energy future for their grandchildren,” explains Team UOW. The jurors thought so too, and Australians took home first prize! Want more info on a ‘fibro’ house and exactly how it fits into the Australian landscape? Check out this informative overview from Matt Hickman at Mother Nature Network. Visit Sally’s Blog for more B.U.G. Designs. This October 20 university teams from across the world will present the culmination of over two years of work with their state-of-the-art green homes. The Solar Decathlon 2013, to be held in Irvine, California from October 3 through 13, challenges student teams to design, build and present net zero energy homes. Each team is encouraged to design and build a solar, modular home that answers the needs of their particular environment within a greater framework of sustainability. Rainwater HOG is delighted to announce that Team ASUNM, a collaboration between Arizona State University and the University of New Mexico, will be using six HOG tanks in their SHADE home. What we like about the contest framework is that it allows for a greater diversity of design while encouraging students to strategize solutions for specific locations. The Solar Decathlon also provides students with invaluable hands-on experience in multiple aspects of the green building industry. So, while Team ASUNM envisions a solution for urban sprawl in the desert environment (where the city of Phoenix has grown to 4.5 million people), the Middlebury College Team has designed their New England home with wood flooring harvested from sugar maples – the Vermont state tree – to support their local economy. We’ll be following (and cheering!) Team ASUNM on The Whole HOG through their journey to Irvine, California. Next month, we’ll delve deeper into some of the sustainable technologies Team ASUNM will showcase with SHADE – including a look out how our HOG tanks will be used. We hope you’ll join us! “To me it’s the story of place, either real or desired, that inspires the architecture. The context of the site, the environment – natural or man made – is the origin of the design evolution,” explains architect Geoff Butler of his design process. We’re revisiting his Mill Valley Green Home one year after it’s lush, photo-filled debut in San Francisco Magazine, with more gorgeous pictures from the synonymously named web site. Why is it beautiful? Geoff Butler didn’t have to look far for inspiration when designing the Mill Valley Green Home, a showpiece of sustainability located in his hometown. The home incorporates staples of California living – skylights, outdoor showers, easy transitions between indoor and outdoor space – with energy efficient details like radiant heating, a solar ready system, and an electric car charging outlet in the garage. Why is it useful? The Mill Valley Green Home is leading by example with a cutting edge, three-tiered home design that includes the latest in luxury green features in California’s Bay Area. LEED Platinum certification is pending. And although in a rarefied price range, this luxury home incorporates green solutions that can be introduced on a smaller scale to the mid-range market. Why is it green? 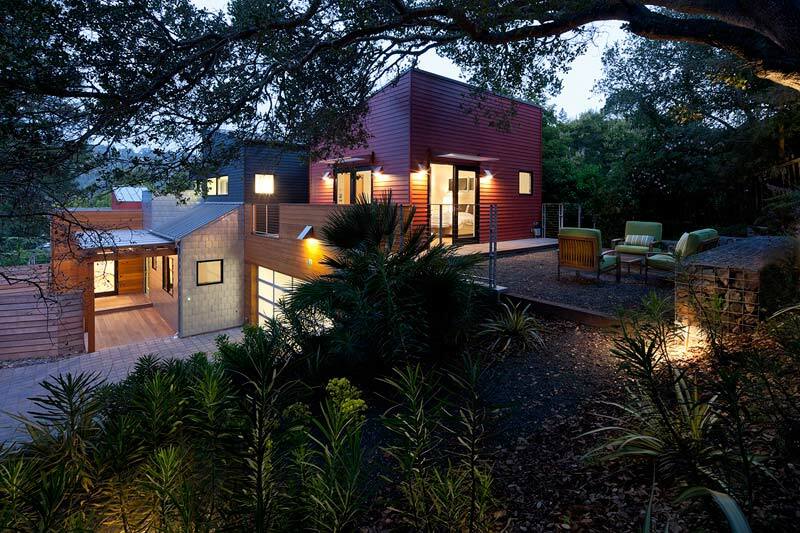 “Bottom line energy savings, water reuse and drought tolerant landscaping,” are three eco-friendly features that Geoff Butler readily identifies in the Mill Valley Green Home. Nineteen Rainwater HOG provide 1,000 gallons of rain and grey water storage for landscape irrigation and toilet flush. Even in the construction of the home – aimed to show that green does not have compromise in quality or cost – more than 50% of the wood used was recycled from the original home. Check out Sally’s blog for more B.U.G. designs. When it comes to homes, Beverly Maloney- Fischback, CEO, founder and publisher of Organic Spa Magazine, believes in “good bones” and green renovation. 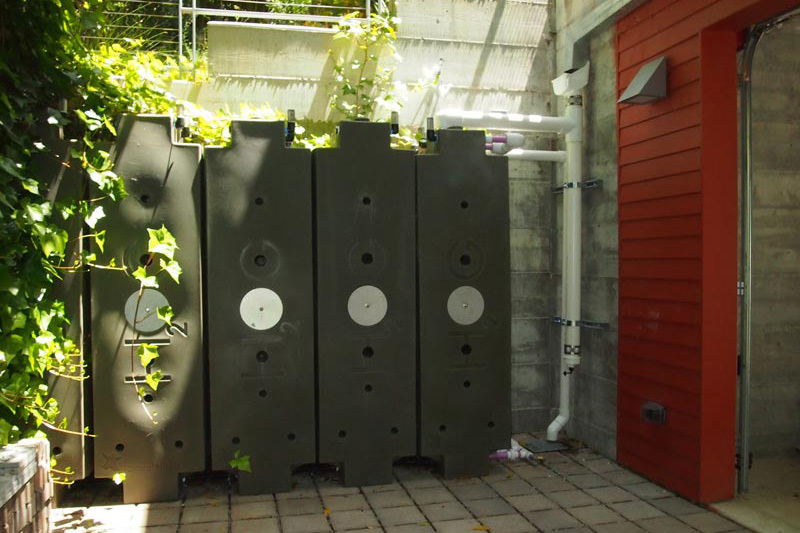 A four-HOG modular system harvests the rain at the Rocky River Green Home. She is incorporating the values of the leading American eco-lifestyle magazine that she helms into her Rocky River Green Home (RRGH) renovation. The home will be the first green energy-efficient home in the neighborhood, and the first renovated green home in the Rocky River region, located outside of Cleveland, Ohio. She touts the benefits of rainwater harvesting in a recent RRGH blog update. Her new home will use four Rainwater HOG tanks, which will capture rainwater year-round to the tune of 1,200 gallons annually, for landscape irrigation. Why did Bev choose HOG tanks? Not to mention that HOG plays well with others! Unused grey water from the home’s Brac Grey Water tank system will be fed into the HOGs for lawn and garden irrigation. Solar heating joins rainwater harvesting and grey water recycle in an energy efficiency triple-threat at the RRGH. And, Beverly notes, she and her husband made sure to incorporate “a dose of spa wisdom and wellness into their design” with the second floor yoga room with sunset and lake views, and an “organic spa” themed master bath. Owners of the Glencoe Green Home, profiled in August 2012, can relate. Rainwater HOG is looking back on a successful 2012. And, as we move into 2013, we’re looking outward for more, from a green building industry perspective on rainwater harvesting to the establishment of a National Green Building Standard in Hawaii. This month, we have Apps to bring rainwater harvesting and global warming to your door; not to mention personal, national, and global perspectives on water on this transforming planet. With global warming in mind, Chuck Henderson is taking tangible action by creating super- flexible, super-strong, and super-inexpensive conic shelters. Read about them in our B.U.G. Design section. 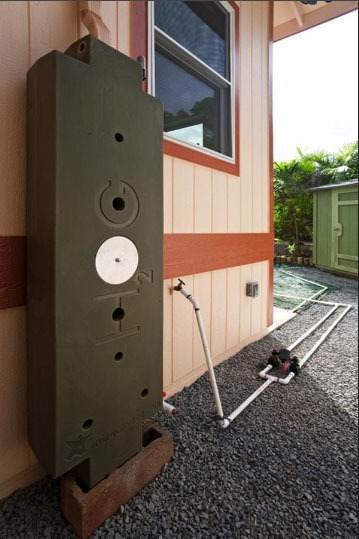 We originally encountered this remodeled home (shown left), the first to be certified to Hawaii’s nascent National Green Building Standard, in November 2012, making note of their use of HOG tanks for garden irrigation. “The biggest lesson we learned is that a certified green home can be built for the same price as a regular home,” explains Leanne Bossert. She is president and co-owner of Bossert Builders, the general contractors who rebuilt the home after it burnt in an electrical fire. Read more about this green home’s rise from the ashes in the EcoHome article. A recent article in Contractor Magazine showcases recent rainwater catchment system installations, mostly large-scale for toilet flush and irrigation, across the United States. From Washington state to Illinois, North Carolina, and Virginia, writer Candace Roulo makes the case for rainwater harvesting as a useful tool in the arsenal of plumbers, green builders, and mechanical contractors.